It’s that time of year for another wonderful holiday season. As a tradition, Julian celebrates its tree lighting the Saturday after Thanksgiving. The event includes a variety of performers and carolers, a living nativity, and much more. Consider a stay at Orchard Hill with a lovely walk to town and, later, a delicious four-course dinner at the Inn. Town festivities begin at 2:00 pm. Think of giving loved ones a gift certificate to Orchard Hill as a special holiday gift! The certificates are beautifully prepared and never expire. If you are interested in purchasing a certificate, please call us. 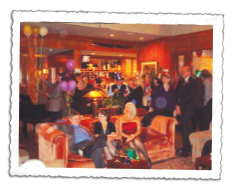 Our celebration begins on December 30th with a casual party at Pat and Darrell’s home from 5:00 pm to 7:00 pm. It’s a great way to come together and watch the second-to-the-last sunset of the year. On December 31st we will serve a multi-course dinner followed by a midnight champagne toast and party. The dining and party package price is $325 per couple and does not include the standard room rate. A two-night stay is required, and we do not accept arrivals on the December 31st. There is a three week cancellation for this event. Beginning January 1st, any two-night stay will receive their second night at half-price. This special ends February 1st and cannot be combined with other discounts. A stay in January is a great Christmas gift. We will also be serving dinner on Saturday and most Sunday nights in January. If you have our four-course dinner on Sunday night and extend your visit to include Monday, your second night is half-price. This special will continue through the spring of 2017. We hope to hear from you soon. Have a wonderful Thanksgiving!